A very traditional British public school education left me fairly averse to the hedonistic pleasures of the spa experience. Cold showers were more my sort of thing. But for the last couple of years I have enjoyed the Austrian spa experience after a day’s skiing in the mountains. Today, finding myself with a free evening in Bath, I thought it might be fun to try out the town’s eponymous facilities. I visited the New Royal Bath, a fusion of glass, stone, light and water. It has two spectacular baths, one on the roof, fed by the natural thermal waters. 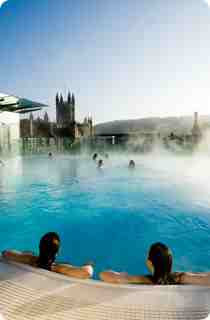 It also has a series of aromatic steam rooms, so you can bathe in eucalyptus, frankincense, lavender and, I think, mint. It was even better than I thought it was going to be. I visited the Roman baths as a boy and imagined then what it might be like to take a dip in the waters. As I remember, they were rather green, a bit smelly, but very warm. The water tonight was crystal clear, odourless (except in the steam rooms) and wonderfully warm and relaxing. Being able to float in an enormous pool whilst looking out over the rooftops of the town, with Bath Abbey a few streets away, was extraordinary. I will definitely be visiting again.